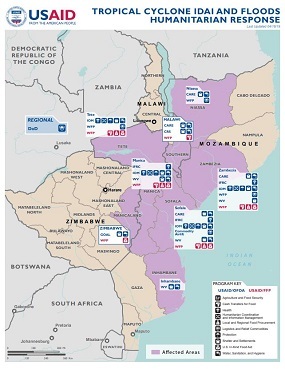 Mozambique Cyclone | USAID CIDI is an education organization that is focused on effective public donations in support of disaster relief. 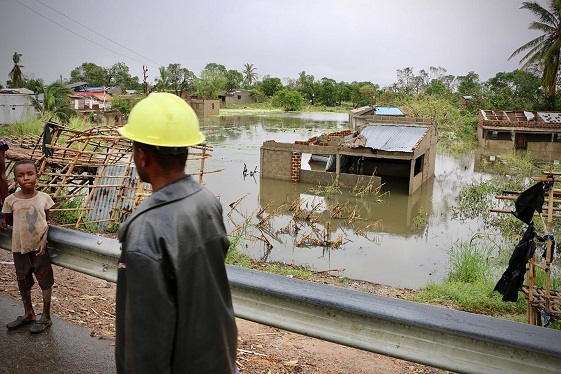 Tropical Cyclone Idai made landfall over Mozambique between March 14 and 15, producing torrential rains and strong winds across the country, as well as in neighboring Malawi and Zimbabwe. The cyclone caused catastrophic flooding, which has damaged homes, public infrastructure, and farmland, and exacerbated existing needs arising from flooding in early March. Hundreds of thousands of people have been displaced and the lack of electricity, damage to major roadways and bridges, and continued flooding is adding to an already dire situation. 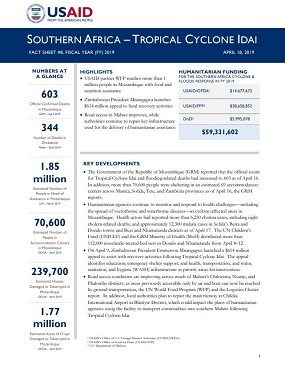 In response, humanitarian organizations are providing lifesaving assistance and working to address the urgent needs. These groups are providing emergency food, water, health care, and shelter supplies to the families who have been affected. When disasters occur anywhere in the world, Americans generously offer assistance to those in need. Decades of experience in disaster relief and recovery have shown that the best way to help people affected by disaster is to make cash donations to reputable relief and charitable organizations on the ground. These groups work closely with affected communities, and know what people need and how to strengthen recovery efforts. Cash donations are the most efficient form of assistance. Unlike material donations, cash involves no transportation costs, shipping delays, or customs fees. It also enables relief organizations to spend more time providing aid by spending less time managing goods. Cash donations also allow relief supplies to be purchased in markets close to the disaster site, which stimulates the local economy, thereby boosting employment and generating cash flow to stimulate the local economy. If you are considering making a monetary contribution to a relief organization, you can find detailed financial and programmatic information at GiveWell, Charity Navigator, Charity Watch, and the Better Business Bureau. * Disclaimer: The appearance of hyperlinks does not constitute endorsement by the U.S. Agency for International Development (USAID) of non-U.S.Government sites or the information, products, or services contained therein. USAID CIDI does not exercise editorial control over all of the information that you may find at these locations. Such links are provided consistent with the stated purpose of this website. InterAction is an alliance organization in Washington, D.C. of nongovernmental organizations (NGOs). Our 180-plus members work around the world. GlobalGiving is the first and largest global crowdfunding community that connects nonprofits, donors, and companies in nearly every country around the world.